Also known as the Thousand Buddha Grottoes (千佛洞), form a system of 492 temples 25 km (16 mi) southeast of the center of Dunhuang, an oasis strategically located at a religious and cultural crossroads on the Silk Road, in Gansu province. 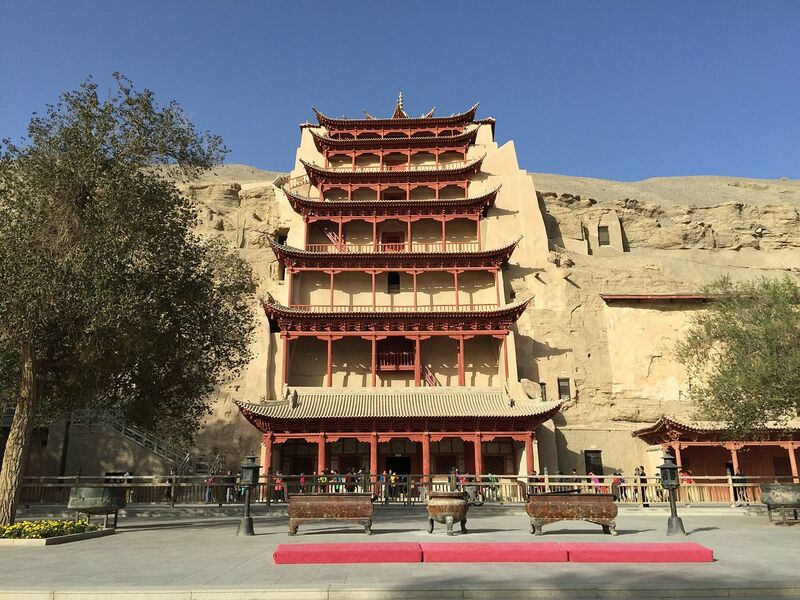 The construction of the Mogao Caves near Dunhuang is generally taken to have begun sometime in the fourth century AD. The first caves were dug out in 366 AD as places of Buddhist meditation and worship. The cave no. 17 discovered by Wang Yuanlu came to be known as the Library Cave, walled off sometime early in the 11th century. Up to 50,000 manuscripts may have been kept there, one of the greatest treasure troves of ancient documents found. 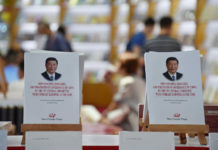 While most of them are in Chinese, a large number of documents are in various other languages such as Tibetan, Uigur, Sanskrit, and Sogdian, including the then little-known Khotanese. The content of the library was dispersed around the world, and the largest collections are now found in Beijing, London, Paris and Berlin, and the International Dunhuang Project exists to coordinate and collect scholarly work on the Dunhuang manuscripts and other material. The caves themselves are now a popular tourist destination, with a number open for visiting. The site is located about 16 km west of the city of Datong, in the valley of the Shi Li river at the base of the Wuzhou Shan mountains. They are an outstanding example of the Chinese stone carvings from the 5th and 6th centuries. All together, the site is composed of 252 grottoes with more than 51,000 Buddha statues and statuettes. After the decline of the Jin Dynasty, the northern parts of China came under the control of the Northern Wei. They made the city of Pingcheng, now known as Datong, their capital. Due to its promotion, Pingcheng saw an increase in construction work. The Northern Wei early adopted Buddhism as their state religion. 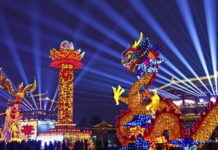 Buddhism arrived in this location via travel on the ancient North Silk Road, the northernmost route of about 2600 kilometres in length, which connected the ancient Chinese capital of Xi’an to the west over the Wushao Ling Pass to Wuwei and emerging in Kashgar before linking to ancient Parthia. Since the end of the works, the sandstone of the grottoes has been exposed to heavy weathering. The ensuing centuries therefore saw several attempts to preserve the caves and to repair sustained damage. During the Liao Dynasty the caves saw some renewing of statues and the buildup of the “10 temples of Yungang” from 1049 to 1060, that were meant to protect the main caves. However, they were destroyed again just some 60 years later in a fire. The wooden buildings extant in front of caves 5 and 6 were constructed in 1621, during the early Qing Dynasty. Since the 1950s, cracks in the sandstone have been sealed by grouting, and forestation has been implemented in an effort to reduce the weathering due to sandstorms. The Longmen Grottoes (龙门石窟) or Longmen Caves are one of the finest examples of Chinese Buddhist art. Housing tens of thousands of statues of Buddha and his disciples, they are located 12 kilometres (7.5 mi) south of present-day Luòyáng in Hénán province. There are as many as 100,000 statues within the 2,345 caves, ranging from an 1 inch (25 mm) to 57 feet (17 m) in height. The area also contains nearly 2,500 stelae and inscriptions, whence the name “Forest of Ancient Stelae”, as well as over sixty Buddhist pagodas. The earliest history of the creation of Longmen Grottoes is traced to the reign of Emperor Xiaowen of Northern Wei dynasty when he shifted his capital to Luoyang from Dàtóng; Luoyang’s symbolic value is borne by the fact that it served as the historic capital for 13 dynasties. The grottoes were excavated and carved with Buddhist subjects over the period from 493 AD to 1127 AD, in four distinct phases. The first phase started with the Northern Wei dynasty (493-534). The second phase saw slow development of caves as there was interruption due to strife in the region, between 524 and 626, during the reign of the Sui dynasty (581-618) and the early part of the Tang dynasty (618-907). The third phase, was during the reign of the Tang dynasty when Chinese Buddhism flourished and there was a proliferation of caves and carvings from 626 to the mid 8th century. The last phase, which was the fourth, was from the later part of the Tang dynastic rule extending to the Northern Song Dynasty rule, which saw a decline in the creation of grottoes. It came to an end due to internecine war between the Jin and Yuan dynasties. Guyangdong, orGuyang Cave, or Old Sun Cave, is recorded as the oldest Longmen cave with carvings in the Northern Wei style. It is also the largest cave, located in the central part of the west hill. It was carved under the orders of Emperor Xiaowen. The earliest carving in this limestone cave has been now dated at 478 AD, during the period when Emperor Xiaowen is thought to have been moving his capital from Datong to Luoyang. The Buddhist statues in the niches of this cave are very well sculpted. 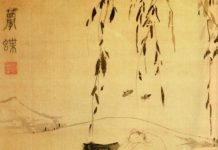 The Tomb of Bai Juyi on the east bank is that of the well-known poet during the Tang Dynasty who lived in Luoyang during his later years. The tomb is located on the hill top. It is approached from the west bank after crossing a bridge across the Yi River. The tomb is a circular mound of earth of 4 meters height with a circumference of 52 meters. The tomb is 2.80 meters high and has the poet’s name inscribed on it as Bai Juyi.